H.E. Róbert Fico, Prime Minister of the Slovak Republic, visited the OECD on 11th April to address the OECD Council (Read his remarks) and to hold a Lunch Seminar on Slovakia’s reform agenda with the Secretary-General, Mr. Angel Gurría, and OECD experts (Read the OECD Secretary-General's remarks). The seminar provided an important opportunity to exchange views and policy advice on key areas of interest as requested by the Slovakian government, in particular on employment, education and public administration reform. It also allowed to discuss opportunities for further collaboration. The Prime Minister and the Secretary-General held a Press point at the end of the Council meeting. Prime Minister Fico was accompanied by Ambassador Ingrid Brocková, Permanent Representative of the Slovak Republic to the OECD. 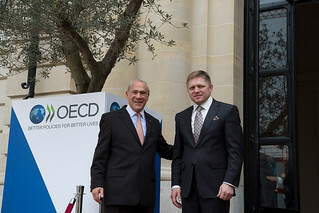 11 April 2013 - Angel Gurría, OECD Secretary-General and Róbert Fico, Prime Minister of the Slovak Republic.